Graduation party games can turn a boring open house into a fun party your friends will never forget! Congratulations! You graduated and now it is time to plan the best graduation party ever held. Most parties consist of an open house where you send out graduation invitations to your family and friends so they can stop by, eat cake, say "hello" and drop off your gift. However, there is nothing stopping you from having a great time at your party. The guest list will include a mix of your friends from school, family, neighbors and everyone else your parents want to invite over to show off their new "graduate." It is not unusual to find the students congregating in the basement to hide and have a good time. If you want to spend quality time with your friends, consider having two graduation parties, one for the adults and neighbors and another one just for your friends. You can hold these on separate days, or in tandem. For example, if your party is at 2 pm on a Saturday, invite your school friends over at 5 pm for left over cake, pizza and a party. Graduation party games can be as simple as playing your favorite board games or as complex as an all out "solve the mystery" game. 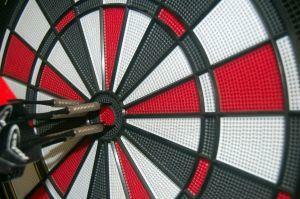 If you have a dart board, pool table, or ping pong table, your guests will have fun no matter what you decide. Create activities that you and your friends will enjoy playing. These are also fun games to take with you to college for those nights where you don't have any studying to do. Board games are not always an option. However, there are some fun graduation party games you can involve everyone in. Win, Lose or Draw: All you need is a dry erase board and some markers. Divide into teams. Ask all participants to write down a movie, song, noun, person, or phrase on a piece of paper. Collect the entries and throw them in a hat or bowl for the other team. Whoever is "up" draws the picture until one of the guests successfully guesses what they are making. Charades: This is similar to "Win, Lose or Draw," except instead of drawing you act out the category without saying anything. Ready to Graduate? : Before your party, go online and pull up an encyclopedia. Pull out a combination of fun and challenging trivia facts and things you should know to graduate from high school (such as who wrote "Grapes of Wrath" or a math formula.) Divide into two teams and hand each team a pile of questions. Take turns quizzing each other. If someone gets an answer wrong, they are out. The team still standing at the end wins. Karaoke: If your friends love to sing and make fools of themselves, rent a karaoke machine and relive your grade school through high school years. Don't forget the video camera! Mystery: Create a mystery and send your friends on a scavenger hunt to solve it! If the weather is nice, the best graduation party games can take place outside! You can purchase the supplies you need at most large retailers during this season. Since graduation is during warmer weather, water graduation party games can help your guests cool off. If you plan to get everyone soaked, let them know before hand so they can bring their swimsuits. Water gun fights: Visit the dollar store and pick up little water guns or water soakers. Divide into teams. The wettest team loses. Water balloon contest: Fill up your balloons before the party and create your course. The goal is to throw the balloon the furthest. Bucket Brigade: You will need two buckets, two sources of water, and two kids pools, all the same size. Divide into two teams. They will start at the same time. The goal is to pass the water through the line to be the first to fill the pool. If you have a big back yard, you can create "stations" where each team member needs to run to before passing the bucket. Whatever graduation party games you decide to play, the goal of your party is to have fun, relive memories and spend time together before you all take off for college. You can decide on a theme, just hang out, or prepare with with fun competitive games.